Boise State's Octavius Evans leaps over a Virginia defender during an NCAA college football game in Boise, Idaho, on Friday, Sept. 22, 2017. Virginia won the game 42-23. We won’t know who Boise State will put on the field against Florida State until it happens. The Broncos’ 2018 spring game serves as a reminder, with Octavius Evans still idle. BOISE, Idaho — Thursday, April 11, 2019. 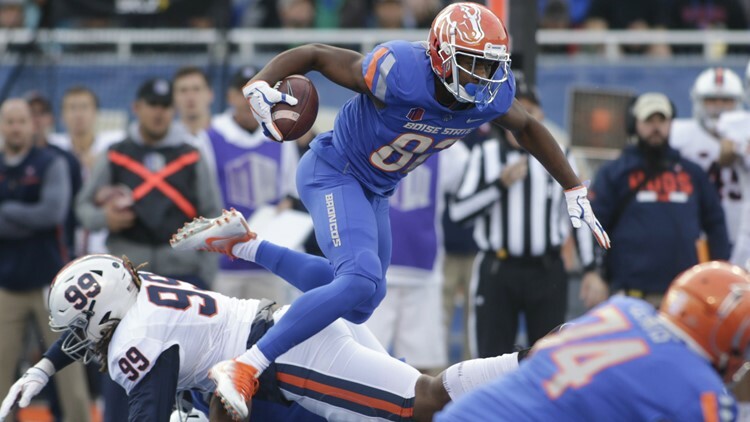 Raise your hand if you’re rooting for Octavius Evans to get back on the field for Boise State. It has to be maddening for him as he tries to get healthy. Evans didn’t suit up for the Broncos’ spring game last Saturday, almost a year after he was awarded jersey No. 1 before the 2018 event. That day he proceeded to make five catches for 124 yards and two touchdowns, and fans anointed him as Cedrick Wilson’s heir-apparent at wide receiver. There was hope all the way through last season that Evans would get back into the lineup, so Boise State kept him active, and he appeared in five games. It turned out to cost him a year of eligibility—if it had been four games, Evans would have been able to use a redshirt year. Evans looked like a feature receiver candidate coming out of spring ball last year, but he had just two catches for 12 yards during the 2018 season and didn’t play again after the Colorado State game in October. That after a promising true freshman season in 2017 that produced 15 grabs for 131 yards and two touchdowns. Now—hopefully in fall camp—Evans will try to pry his way back into a wide receiver rotation that will include John Hightower, Khalil Shakir, CT Thomas, Akilian Butler and promising redshirt freshman Stefan Cobbs, among others. A day after Colton Saucerman and his big red beard reappeared, there’s another key addition for the Idaho Steelheads as they gear up for the Kelly Cup Playoffs. Forward Reid Petryk has returned from his AHL callup with the Chicago Wolves to resume his role as a Steelheads mainstay. In 52 games with Idaho this season, Petryk has scored 19 goals with 25 assists. He’s put up nine power play goals and five game-winning shots. Despite almost three weeks away, Petryk still leads the Steelies with nine power play tallies. He was ECHL Player of the Week the first week of January. Game 1 against the Utah Grizzlies in the ECHL Mountain Division semifinals is set for Friday night. Former Boise State Bronco Trent Johnson did accept an assistant coach’s position with Cal, but for awhile Wednesday it looked like it didn’t mean much. Chris Murray of NevadaSportsNet.com reported that Johnson and former UCLA and New Mexico coach Steve Alford both met with Nevada athletic director Doug Knuth. But by late in the evening, news broke that Alford had agreed to terms with the Wolf Pack. Alford was fired by the Bruins 13 games into this past season, but he’ll be seen as a big-name hire in Reno. Alford was a force during his years with the Lobos. He was 155-52 in Albuquerque and won six Mountain West titles (four regular season and two tournament). New Mexico was a Top 25 team when Alford left for UCLA. He should be very comfortable in his old conference. Former Boise State star Graham DeLaet was on Idaho SportsTalk Wednesday and confirmed that his targeted return to the PGA Tour is when the 2019-20 season begins at the end of September. “I was hoping to get back sometime this summer, but everything’s been moving along slower than I thought,” DeLaet told Caves & Prater. “But I’m feeling better every month.” DeLaet is still rehabbing his back after surgery last July. By this fall, it will have been almost two full years since he played a tour event. The Los Angeles Lakers set a team record for futility, losing their 54th game of the season in a 112-95 loss to the Golden State Warriors. The Lakers would finish the season 27-55. Then they’d break that sorry mark in each of the following two seasons, going 21-61 and 17-65, respectively. This game was symbolic of the power shift in the NBA, as the Warriors’ Stephen Curry scored 30 points with 12 assists and 10 rebounds. Golden State would win its first NBA championship in 40 years the next season.